1 of 4 Heat oven to 425 degrees. Whisk together flour, 2 tablespoons of the sugar, the baking powder and salt. With hands, mix butter into flour mixture until coarse crumbs form. Stir in milk and almond extract. Gently gather dough, divide into 6 pieces and place on a baking sheet about 2 inches apart. Bake at 425 degrees for 12 to 14 minutes, or until lightly browned and cooked through. 2 of 4 Meanwhile, combine 1 1/3 cups of the blueberries, 1/2 cup of the sugar, the lemon juice and lemon zest in a small pot. Bring to a simmer over medium heat; cook 6 minutes or until blueberries burst and mixture thickens slightly. Stir in remaining 2/3 cup blueberries. Remove from heat and cool slightly. 3 of 4 In a medium bowl, beat heavy cream on medium-high speed until foamy. Add vanilla extract and remaining 1 tablespoon sugar and beat until stiff peaks form. 4 of 4 Slice shortcakes in half lengthwise. 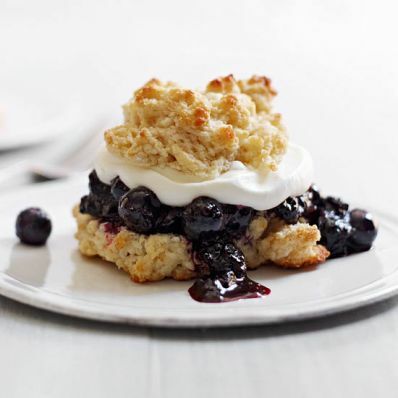 Spoon 1/4 cup of the blueberries on top of the bottom half of each shortcake; dollop each with whipped cream. Place top half of shortcake on each and serve. Per Serving: 16 g sat. fat, 3 g fiber, 82 mg chol., 26 g Fat, total, 56 g carb., 256 mg sodium, 5 g pro., 464 kcal cal.